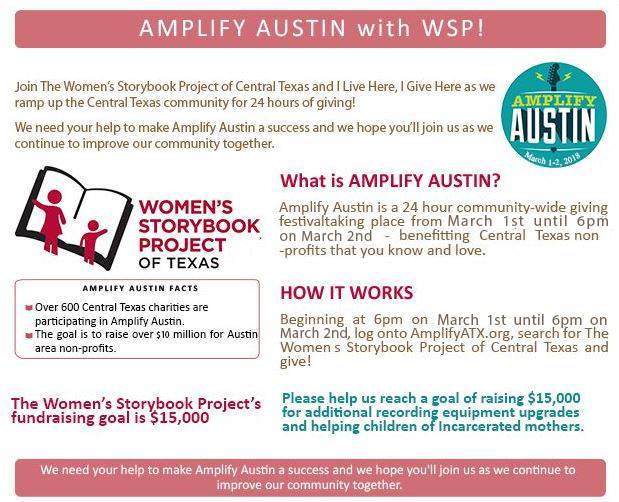 Home » Get Involved » “FUN”raise for WSP and help Amplify Austin! 5 Ways To Make An Impact And AMPLIFY Austin! It’s almost here! Amplify Austin is just around the corner, and we need your help in making it a success for our organization. We can reach so many more lives and truly make an impact in central Texas. Set it and forget it! Simply go to http://bit.ly/AmplifyWSP and enter a donation amount. Just think: $25 will buy two new books, a mailer and postage for two children. $100 will purchase 8 digital recorders. Success is dependent on a strong community of support. Spread the word! We’ve included some sample Facebook posts and Tweets you can use at the bottom of this post. Add a reminder to your calendar: Click here for Google Calendar. – Individual Fundraiser set up guide, click here! Thanks for being a friend to our organization. We couldn’t do the work we do without you. Your support works! We encourage you to read the prompts in our blog post titled “Emilie’s Epiphany” and write a social media post about your own personal experience. This way, the posts you share will be with utmost sincerity which will likely resonate with far more people. For more information, please contact Sun Connor at admin@storybookproject.org.